Mrs Bolas Heathens wanted to go to Ikea this morning. I was not keen as I hate the place but we struck a deal – we’d find a few caches on the way! We opted to look for the new “CAMO” caches near Essington and all were nice easy finds with the exception of one, which turned out to be hidden in undergrowth. Not a normal way of hiding a cache as it tends to result in the area getting bushwacked by cachers. We gave up on it and then spotted something on the logs at the next cache, which gave us the hint we needed. We returned for a quick find. Then, it was off for one final cache before arriving at Ikea. Another nice easy one that we’ve been meaning to find for ages. An interesting spot for a cache too – an old graveyard resulting from a cholera outbreak in the 1800’s. Now for the boring part – the trek round Ikea :-(. 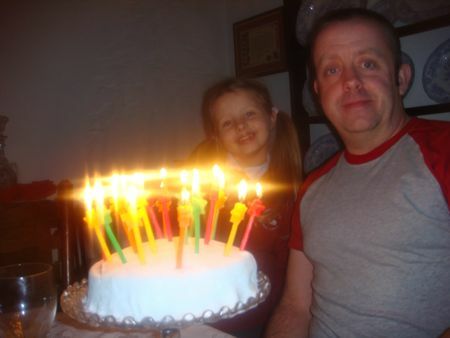 Yesterday was my birthday and we were due round at the in-laws with the children for a lovely birthday tea. As I was driving over (the children had gone ahead with Sarah), I was thinking to myself that it would be nice to do a cache on my birthday, but that there were none anywhere around that we had not already found. Later on, we’d just finished the meal and I had a quick check of my emails. Unbelievably, there was a new cache not 2 miles from the in-laws house and it had literally just been published. We finished up and said our goodbye’s before I headed off to find the new cache while Sarah and the kids went home. I was soon as GZ and got out the torch for the quick walk over the churchyard to GZ. The cache was an easy find and I was delighted to find I was FTF! What a birthday present. On the way back to the Jeep, I checked the iPhone and could not believe it when I spotted another new cache, right on my way home from the first one. A short drive later and I was at GZ for the second one. This one took a bit more finding as the co-ords were 275 feet off, but the hint was clear and I only had two candidates to check. 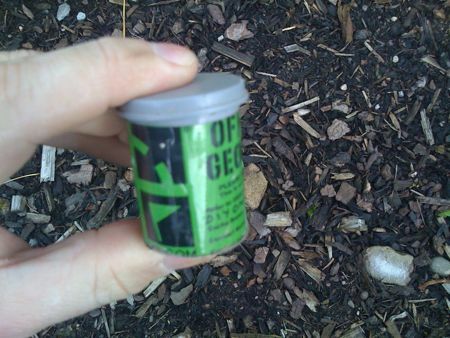 I found the cache in the first one I looked at – wooohoooo – two FTF’s on my birthday. Now to go home and relax in front of a log fire to watch Spooks – perfect :-). 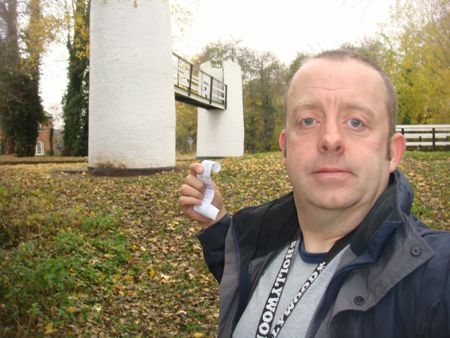 The Middlewood Circular series of caches was our target for this weekend. The series follows an old railway line (now a walking path) from Marple down to Macclesfield and then back to Marple along the Macclesfield canal. The cache owner has split it up into three chunks to make it more manageable and only parts 1 and 2 have been published so far. This takes you as far south as Bollington, which is still a substantial walk. We opted to use our bikes as the old railway path looked to be good and the towpath on the way back would be ok for us. I’m not sure of our total mileage but it will probably be around 13-15 miles. On the way to the start we picked up the replacement cache at Tesco’s in Stockport. A *much* better placement than it’s predecessor, which was just chucked in the undergrowth. It was only about 3 degrees so we put hats, gloves, fleeces and coats on and set off. All the caches were easy finds, with a nice variety of sizes and hide styles. We struggled with one called Wood End, which already had a DNF on (it looks to have been muggled by some wildlife before FTF) and then one called Iron Bridge on the way back up the canal. You guessed it, it was a micro hidden magnetically on a big metal bridge. Tons of places it could be. We looked all over and could not see it. By the time we’d finished the series it was part way through going dark so we cycled back to the starting point for a nice cup of warming soup from our flask. Just time to get the other two nearby caches, which could be done as cache and dashes. On the way back to the M6 and home, I could not resist a quick diversion to find a nano this side of Knutsford. I wanted to get the nearby new Pieman one as it had to be found by tomorrow but Isaac was insistent he wanted to get home in time for Merlin on the TV, so that one will have to wait for another day. A fab day out with a lot of cycling in some lovely countryside and virtually no mud all the way round, which is good for this time of year. We had to take Isaac to Stafford for an interview at the Grammar School as part of his 11-Plus this morning, so took the chance to find the two new caches in Stafford. These have been our closest to home Not Found’s ever since they came out. The first was a replacement cache in the Retirement Plan series, which we finished ages ago. This cache is themed around B&Q (it’s called “Orange Wednesday’s”) and B&Q moved to a new site in Stafford a while ago, so the cache had to be moved. We were supposed to go to two earlier caches in the series to get the co-ords for the new cache, but the cache owner’s kindly provided us with the details needed so we were saved the extra leg-work. 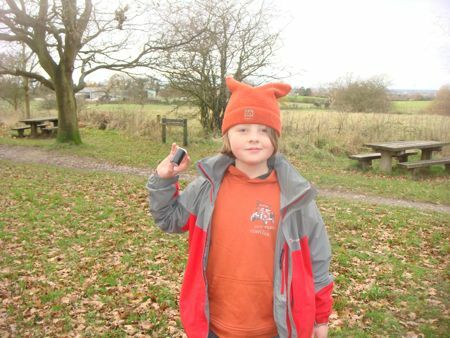 The second cache was a really easy cache and dash on Doxey Marshes, not too far from the M6. A lovely area for walking and absolutely tons of wildlife around the Nature Reserve. I spotted the hide as I walked up and went in for an instant find. Pity the cache was only on the edges of the Nature Reserve and not further in, but I guess permission issues dictated it’s placement. All too soon we were on the road home and the day’s work that was awaiting me. We were taking Isaac and a friend to see the new James Bond film in Shrewsbury this afternoon and arrived a few minutes early so thought we’d fill up with diesel at the Asda just down the road from the cinema. I’d just started to fill up when the guy filling up the other side of the petrol pump said “Hello John”. It was Ben – thefortytwa on geocaching.com. What a total co-incidence as I’d only been thinking the other day that it was a while since we’d seen any logs from them. We had a quick geo-chat while we were both filling up our cars before going on our way. Hope you get chance to do some more caching soon Ben – and maybe hide some more caches as we really enjoyed your last ones.